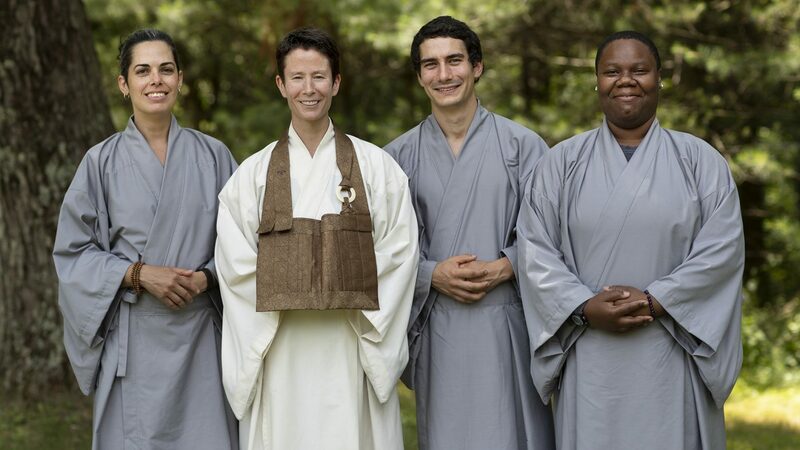 In June, Shugen Roshi & Zuisei Sensei met with staff at the new Middle Way school, a Buddhist-oriented school serving Hudson Valley families, including several sangha members. Zuisei Sensei also traveled to New Jersey to offer beginning instruction at the invitation of a parents group there. Also in June, Hojin Sensei met with residents at the Brooklyn YWCA for beginning instruction in zazen, and the group is excited to continue practicing together on a regular schedule. In July, Shugen Roshi & senior monastic Yukon Grody traveled to New Zealand for several weeks of teachings, study, and to add to the celebration of the Kiwi sangha’s 30th anniversary as an Affiliate of the Mountains & Rivers Order. While in NZ, Roshi led workshops in several locations, a full-week sesshin with fifty participants, gave the precepts to three MRO students (see more below), and welcomed one new training student. Also in July, Zuisei Sensei gave a talk on Buddhist practice at the Refuge Recovery meeting in Kingston, NY, a Buddhist-based support group for recovering addicts and alcoholics, their friends and family. 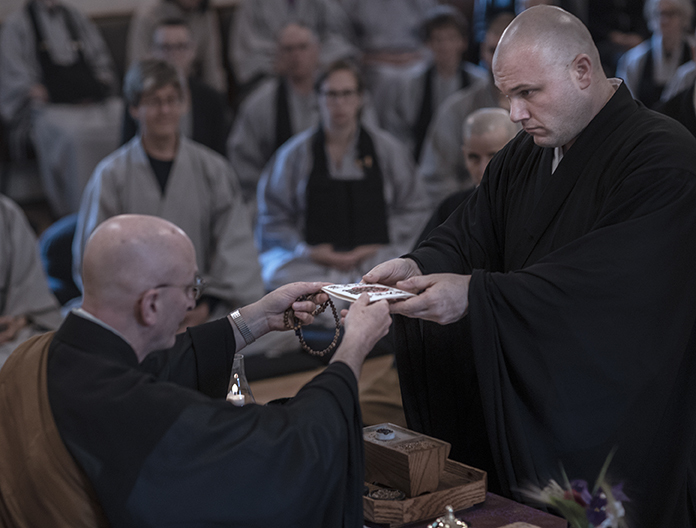 On Sunday, June 10, 2018, Shugen Roshi officiated Tokudo, the full monastic ordination, for Jeffrey Kyukai Onjin Plant. During the ceremony at the Monastery he received the kesa, zagu, monastic bowls and lineage chart as well as the monastic name Kyukai, which means “reverence for the world.” Onjin first joined the residential community in 2001, after which he returned to Southern California, practicing at Hazy Moon Zen Center and Yokoji Zen Mountain Center. He returned to the area in 2006, re-entered residential training and became a postulant monastic in 2014. Onjin has served the sangha as bookkeeper, cook, graphics artist, and currently as assistant gardener. 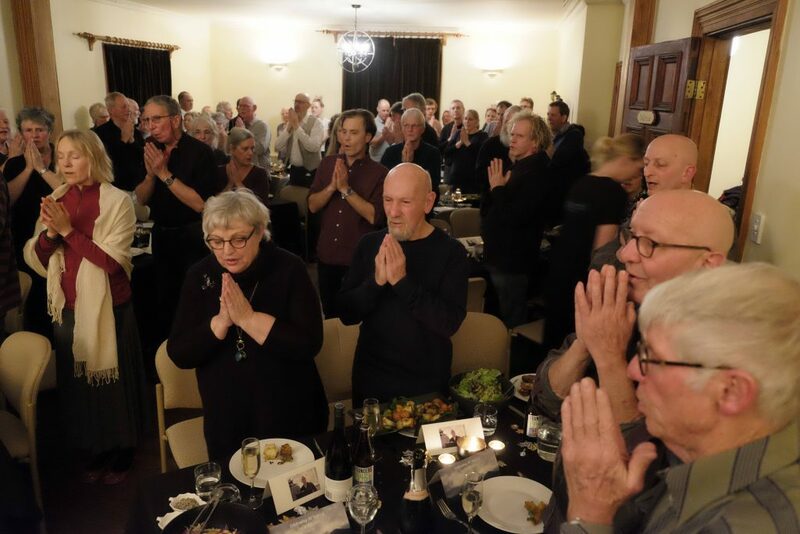 During the annual visit paid by Shugen Roshi to New Zealand this year, eighty friends of the MRO gathered at Fairfield House in Nelson after their sesshin to celebrate the thirtieth anniversary of when Daido Roshi and Shugen (as a then postulant monastic) first traveled to that side of the globe offering the Dharma. It has been thirty years since then of nurturing and growing the sangha, training and practicing Zen together. This year Roshi was accompanied by senior monastic Yukon, and during our summer months the visiting teachers have been either Hogen Green Sensei or Hojin Kimmel Sensei. 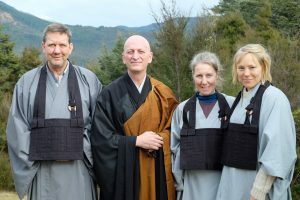 For their part, New Zealanders have continued to enter residency at the Monastery for periods of training, mutually sustaining our practice together and hopefully for many years to come. Click here for the full story. During the visit to New Zealand, Shugen Roshi officiated a Jukai ceremony for three students formally taking the Bodhisattva precepts. Peter Choho “Clear Abundance” Jolly, Karen Toshin “Way of Faith” Daw, and Susanna Soshin “Plain Heart-Mind” Topp. The Diamond Net initiative aims to provide workshops and other support to sangha members in need during times of illness and other difficult life transitions. It is one of several sangha-led initiatives under the umbrella of Dharma Action. A monthly list of upcoming activities is available, and if you wish to be added to the update list or to work with Diamond Net in any way, send a message to diamondnet@mro.org. Zuisei Sensei with (left to right) Maria Jose Jimenez, Steven Siegelski, and Jordan Burnett. Recently a number of practitioners passed through the five barrier gates to become formal Mountains & Rivers Order students. Maria Jose Gimenez, Jordan Burnett, Steven Siegelski, Michelle Laura and Joshua Dittmar became students of Zuisei Sensei while Nolan Wilder and Ravi Mishra became students of Hogen Sensei. In August, new students for Shugen Roshi included Philippa Cosgrove of our New Zealand sangha, and in September, Vera Oziransky. In September new students for Hojin Sensei were Stuart Kennedy and Lou Proccaccino. Congratulations to all! The Monastery would like to thank all of the bodhisattvas who continue offering their assistance at the Temple, the Monastery, and at all our affiliate groups. Gratitude to Bernard Handzel for professional photography for Dharma Communications. Gratitude to Seigo Beres for delicious food stuff, and for foraged chantrelles and portabellos from Tasha Ortloff, and to our mystery donor for the new knife sharpener. New solar arrays were installed this summer (see above) nearly doubling what we had going to the mian building. The initial solar panels were donated by Solar Generation nearly eight years ago. 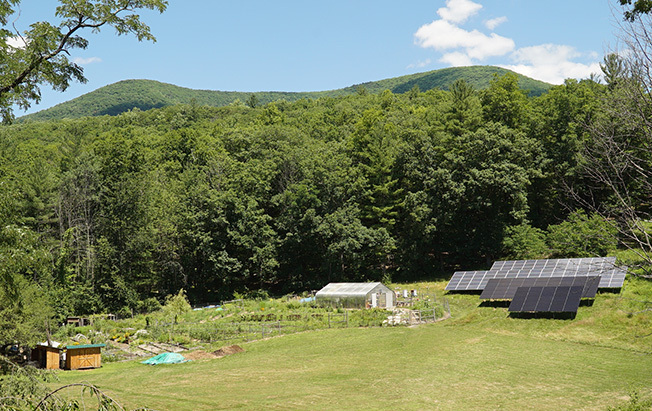 Along with arrays that we’ve placed on Han Shan Meadow and most notably atop the Sangha House, we’re now able to cover most if not all of our electricty needs through solar power and send some of the energy we don’t consume out to the local grid. With the new additions, we’ll be generating approximately 25,000 kW hours per year. This summer also included repainting the west side of the building, progress in the on-going work meticulously restoring the hand-built windows. Workers have also been busy replacing the plumbing on the south side of the building in preparation for much needed fourth floor bathroom renovations. Joining residential training in June was Josh Cedeño of Lodi, NJ for one week. Monastery residents for the month of July included Alicia Fowler of Brooklyn, NY, Alec Burroughs of Brooklyn, NY, Elia Parker of Bluffton, SC and Miruna Stanica of Alexandria, VA. Also in July, Rachel Crummey of Toronto, Canada and Michael Gasparrini of Trumbull, CT for one week, and Gregory Starr of Cedar Park TX and Jay Napoli of Gainsville, VA visited for two weeks of residential training. In August the Monastery welcomed Christine Hiebert of Brooklyn, NY, Ben Bertino of Marietta, GA, Liam Banta of Ann Arbor, MI and Sophie Epstein of Brooklyn, NY for one week, and Mary Pollard of Anderson, SC and Max Finn of Ottawa, IL for two weeks. For the month of August residents included Giselle McBrien of Upper Black Eddy, PA, Eric Truchan of Whitehall, PA, Casey Twichell of Fredonia, NY, Ryo Stone of Wheat Ridge, CO, and Theresa Braine, MRO of New York, NY, and for three weeks Grayson Gurney, So. Amherst, MA. 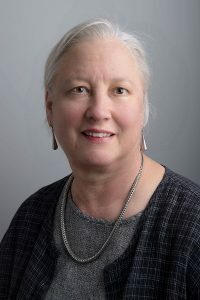 Also in August, Renate Genjo Gebauer, MRO of Chesterfield, NH began one year of residential training. Joining residential training at the Temple for the month of June were Anahi Russo Griddio of Denver, CO and Israel Kidda of Queens, NY, and for the month of July, Diego Antoni of New York, NY. We would also like to thank Jean Ann Wertz who recently completed several months as the Temple’s office manager. Jean Ann kept things running smooth all throughout her tenure with quick humor and attention to detail. Thanks so much!